Every building professional knows that green building is a process, not an event. As a tool for encouraging green building, LEED reflects that reality, providing recognition of leadership in each part of that process, from design and construction to operations and maintenance. This is often overlooked when someone refers to a “LEED Certified” building: Where a building stands in the LEED process is an important distinction. A new fact sheet titled “Energy Performance in the LEED Rating System” explains how the LEED rating systems and requirements are supported by initiatives like the Building Performance Partnership to ensure that high performance green buildings live up to their energy potential. And it is crucially important to understand the difference between potential and actual performance, because in many situations the concepts are conflated. Most folks think of LEED buildings as the shiny new building downtown. They say “It’s green!” or “It’s LEED!”, and it’s true that the building’s design and construction process has been subject to a rigorous evaluation over all categories of sustainability, and a certification level (Certified, Silver, Gold, or Platinum) has been determined. But that’s not the end of the story, as my colleague Lauren Riggs points out in her post. A building should live up to its potential, and it takes another type of building professional to drive the building into the next stage of the green building process. The fact sheet details a crucially important tool in helping to realize a building’s performance in every aspect of sustainability: LEED for Existing Buildings: Operations & Maintenance. LEED buildings certified through EB:O&M are certified based upon their energy consumption in addition to the measures undertaken in the other credit categories covering water, indoor environmental quality, materials, and location. The amount of certified space under EB:O&M has grown by leaps and bounds in the last few years, surpassing the rate of certification for New Construction (see the graph in the fact sheet for exactly how much and how fast). We expect this growth to continue as the building industry (and even the President) focuses on improving existing buildings. We hope that this focus on existing buildings’ performance will encourage folks to ask a follow up question about the new green building in the neighborhood: “Is it LEED EB:O&M?” A response of “Yes” to this question will mean that the building is a top performer not only in energy efficiency, but also in water efficiency, location and transportation efficiency, indoor environmental quality, etc. Take a look at the fact sheet and feel free to post comments below. We hope it illuminates how all these initiatives are coordinated to help us reach our goal of transforming the built environment. Last Monday, Congressman Mike Quigley of Illinois 5th Congressional District paid a visit to the home of Jacek Helenowski to get a firsthand look at one of the highest scoring residential LEED for Homes projects to date - and one of the first net-zero energy homes in Chicago. His goal was to see in-person the technology on display in his north Chicago Congressional District. Quigley is no stranger to green building and design. In 2002, while a Commissioner for Cook County, he was instrumental in drafting and passing an ordinance requiring LEED certification of all county buildings. The ordinance also calls for each modernized county building to achieve certification through the LEED for Existing Building Operations and Maintenance (EBOM) rating system. Since being elected to Congress in 2009, he continues to advocate for sustainable solutions for the built environment. He has voted to create new funding opportunities for K-12 institutions to update their facilities in an efficient, high-performing fashion. He has also been a co-sponsor of legislation to incentivize integrated community planning and to expand Federal procurement of more green products. 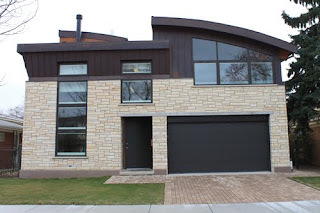 So, it is worth taking note when a green building aficionado is impressed by what he sees. “I have been fighting for greener living since before I was elected to public office over a decade ago, so it’s an honor to have such an achievement in my district,” said Quigley. The Helenowski’s home renovation has clearly been a labor of love. From the use of insulation made from local soybeans to the wood reclaimed from a Chicago building fire, no detail was left unnoticed. It is a great demonstration of innovation and what dedicated people can accomplish when they have a goal. “My hope is that this is the future of construction - because as the Helenowski family has shown us, it is a boon to the local economy, saves on energy costs, and is terrific for our environment,” added Quigley. 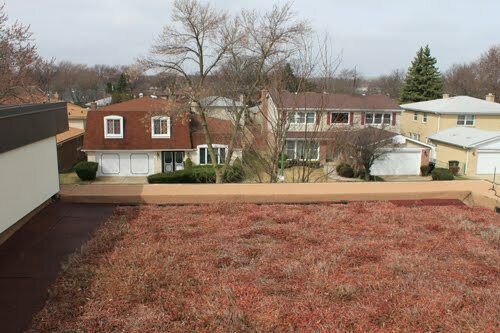 While this home is what builders and homeowners may aspire to, there is a lot that can be accomplished without installing a vegetative roof or a geothermal system. The new LEED for Homes Scoring Tool allows builders to explore LEED for Homes in an easily-navigable system. One of the features is a QuickScore option, where users can answer some general questions about their project and get preliminary feedback on where their project might be rated, along with a list of actions and measures that would need to be addressed. This is an incredibly useful resource to see how current and future projects compare to reaching LEED for Homes certification. For homeowners looking to for tips on making smaller projects green and how to connect with local green building professionals, check out www.greenhomeguide.com. For more information on the LEED for Homes visit: usgbc.org/homes. On a recent trip to Istanbul, I was inspired not only by the stunning culture, beauty, dignity and economic vitality of that city but also by its fast-growing commitment to high performance green building. The vision for green architecture in Turkey combines forward thinking ideas from the rich history of Ottoman culture with the most cutting-edge principles of modern global trends in architecture and engineering. Today, a number of its business and professional leaders are helping to ensure its huge construction and contracting industry (second largest in the world according to McGraw Hill's Engineering News-Record) goes green. I want to tell you about some of the remarkable individuals who have made Turkey a global green building leader. For some basic orientation about Turkey, click here. I want to be clear that I would not have been able to make the trip to this remarkable place without the generosity of Alarko-Carrier, a key member of the 100-member Turkey Green Building Council, known in Turkey as CEDBIK. Alarko-Carrier is an economically productive partnership (now in its 12th year) between the U.S.-based Carrier Corporation and Turkey's conglomerate known as Alarko. The two companies have partnered on a range of important green building projects and products. I had the special privilege of spending time with the chairman of the board of Alarko's holding company, Ishak Alaton. He is something of an institution in Turkey for both his business as well as other diplomatic and philanthropic enterprises, and after just a few minutes in his office, interrupted by phone calls from the Minister of Education and other senior government officials, it was easy to see why. He is a great Turkish patriot but also a genuine citizen of the world in a way that suddenly makes the globe seem like a very small place. His support for the green building movement in Turkey is an important milestone in its evolution. Notably, Hırant Kalataş, a key member of his team, serves on the board of the Turkey Green Building Council. Another Turkish visionary entrepreneur and businessman of national renown that I had the privilege of spending time with was Ali Nihat Gökyiğit. Nihat is one of the founders of Tefken, a company that has grown to include agriculture, banking, real estate development, construction contracting and various investment and industry services. Most significantly, from my standpoint, Nihat was chair of the Turkey Green Building Council, a role he takes extremely seriously. And that is saying something about the importance of the council, as Nihat is a very busy man in the broader environmental movement in Turkey. My guide for most of my very busy itinerary in Istanbul visiting green buildings and meeting leaders in the movement was Dr. Duygu Erten. She received her doctorate in civil and environmental engineering from Rutgers University. A Turkish native with educational training in both Turkey and the U.S., Duygu is one of very, very few women who have broken into the field of civil engineering in Turkey and as such she has faced and overcome challenges that make her a genuine pioneer. She is now serving as CEO of the Turkey Green Building Council and she seems to have less than two degrees of separation from everyone in the entire city, including both Turkish and U.S. business leaders and government officials. She travels the world tirelessly looking for ways to advance the interests of green building in Turkey. Certainly the growing amount of international and Turkish companies – including respected architectural firms - that are supporting that enterprise are testimony to the market traction she has helped create. Trips such as this one remind me of the powerful way that business and professional savvy and creativity can sometimes be linked to a range of socially responsible enterprises to advance market transformation at a huge scale. The U.S. Green Building Council and its LEED rating tool have encouraged and leveraged that dynamic synergy in a powerful way. It was exciting to see that same synergy alive and well and beginning to move the market in Turkey. California’s new building codes took effect January 1, 2011, and policy makers and the industry continue to explore its implications and impact. Referred to as CalGreen, the codes have raised the floor on minimum building standards for new construction, incorporated green elements into base code, and as such are another manifestation of California’s leadership in the green economy. There has been quite a bit of discussion about the relationship between the codes and rating systems like LEED. I’d like to place this issue in a larger context of the overall sustainability goals of California and the importance of leadership in the building industry. The first distinction to keep in mind is that codes and rating systems are fundamentally, necessarily, and structurally different but complementary systems. Codes mandate minimum standards and some specific measures, whereas rating systems like LEED define leadership standards, are performance based, and are rigorously verified by an independent third party. Industry and policy analysts widely agree that LEED is significantly more rigorous than the new building codes, and is the most powerful tool available for market transformation. In addition, LEED has systems for existing buildings, commercial interiors, core and shell, schools, neighborhoods and more. One way to think of all this is that codes define the floor (and are the law), whereas LEED sets the ceiling. Click here to read the rest of the article on the USGBC-NCC site. As the Manager of USGBC’s Building Performance Partnership and Recertification programs here at USGBC, I spend my time thinking over and over again about which aspects of building operations should be regularly monitored and which make the maximum contribution to the continuous high-performance of each building. We have to figure out how to encourage building operators to look at the holistic performance of their buildings and act based on the full story – So, how do we do that? What do we ask them to monitor? How do we work with thousands of building operators to tell the story? Hours of thought and numerous discussions bring me back to what many of us have always known: Start with what is accessible. For most buildings, the easiest place to start monitoring performance is at the energy meter; knowing that energy consumption data is accessible to most building operators through existing meters or utility bills, it seems fair to ask folks to start monitoring their energy performance. If you’ve got water meters, start monitoring water use performance too – remember, we’re working towards a picture of holistic performance. Green building professionals may not know that some buildings don’t even have energy meters, or a way to differentiate one building’s consumption from multiple others on a single campus … I struggle with finding a way to motivate these buildings to begin to track their individual energy use. How much does it cost to clamp on a data logger, or install and connect building level meters to a central system as a part of planned facilities upgrades? It won’t break the bank, which makes it absolutely feasible to track the performance of every building. Not one building owner will reap the benefits of energy or water savings without monitoring and trend logging, even at the building level. Building level performance monitoring is something every building can do. You have to know where to start in order to reach the finish. The holistic picture, the full story, can only be created if you have all of information needed to complete it. USGBC offers tools, such as the Building Performance Partnership, to help buildings begin to tell their story. We will work with them to complete it and improve on it each time the story is told. We hope that our programs will lead to meters in every building (whole building and sub-system), followed by high performance achievement in every building. We will learn to walk, then run - together. Welcome to another extremely busy season for state legislative activity. If you haven’t started paying attention, the action in most states is in high gear, as most state legislatures meet in the first quarter of the year. Some states are even finishing their 2011 sessions and are already closing their doors until next time around. The Florida Legislature is considering a bill that would recognize green building as part of the scoring system for competitive loans offered to affordable housing developers in the state. (A similar attempt was made in Mississippi, but the bill died in committee). Green affordable housing is one of the core areas of USGBC’s advocacy and we strongly support policies that lead to better affordable housing. Several states are considering the use of LEED as a tool for state-owned and -funded building construction – a leadership by example policy that has been adopted by 26 state governments to date. Other states are considering bills that would prioritize permitting for building projects that commit to building green, or invest in retrofitting school buildings to be healthier and more resource- and energy-efficient. And despite the down economy, a few states are considering outlays for tax incentives for green homebuilding and retrofits. (See here for a healthy list of green building incentive strategies. One particular bill in Maryland is worth highlighting, one that would make Maryland the first state to adopt the International Green Construction Code on a large scale. The revised bill is sophisticated in recognizing the distinct and complementary roles of green building codes and green building rating systems (a topic we reviewed in a recent educational webinar with AIA, ASHRAE and ICC). This approach mirrors what I wrote in a previous post and what was spelled out in USGBC’s “Greening the Codes” white paper: We need mandatory codes and standards to improve all buildings on a massive scale, and beyond-code rating systems to continue to encourage and reward leadership in green building. Maryland continues to be a leader in green building policy at both the state and local levels. This message is all the more compelling when you realize that this bill is being considered in a state where minimum statewide requirements are already the highest in the country, by way of the California Green Building Standards Code. The many successes we’ve seen this year already are a testament to the productive partnerships that are growing between green building community members and their lawmakers. USGBC and our chapters will continue to push forwards. Let’s keep up the good work. USGBC and the Better Buildings Initiative: How Do We Get Started Sooner? Pretend you are the President of the United States for a minute. The economy has pulled out of the recession, but everyone is cautious about the fragility of the recovery. To get the energy we need, we’re razing mountains in Appalachia and sending billions for oil to undemocratic, unfriendly governments in the Middle East. And last summer oil drilling trashed the Gulf of Mexico and the state economies that depend on it. So what do you do? Double down on the status quo and sacrifice more of your own country to mining and drilling? Or use less energy so you don’t have to? Seems like an easy choice, but you wouldn’t think so from listening to some members of Congress. But where are the opportunities to use less energy? According to McKinsey and Company, most of the $1.2 Trillion (!!!) efficiency opportunity is in buildings. And where are the largest efficiency opportunities in the building sector? Well, the biggest buildings of course. Last month, President Obama announced an initiative designed to do just that. The Better Buildings Initiative seeks to cut energy consumption in commercial buildings by 20 percent, while saving businesses $40 billion…per year! That’s money that will be spent on salaries and supplies rather than in just keeping the (inefficient) lights on. Click here for a section by section explanation of BBI. Click here for the detailed breakdown of BBI. I’m asking you to join the Coalition for Green Schools not just as the President of the National PTA, but also as a parent, school board trustee and construction professional. In each of these roles I continue to see all sides of the ongoing debate about the need for better school buildings. Our children deserve a safe, secure, healthy and technologically equal learning environment. When the National PTA joined the Executive Committee of the Coalition for Green Schools, I was excited to join a forum with some of the leading national educational and environmental organizations around such an important topic. In the year and a half since the Coalition first convened, I’ve worked alongside leaders from teachers’ unions, school boards, administrators and experts in design and education, and I’ve confirmed that while we all have much at stake on this critical issue, we also all have much to add. In order for all of our children to experience the benefits of green schools, all of our organizations must work together. And that’s why I’m writing today. I’m pleased to invite your organization to join the general membership of the Coalition for Green Schools. Right now, the Coalition Executive Committee collectively represents more than 10 million members. By opening general membership we hope this new pathway for engagement will increase this number and collectively bring our important message to every American. Membership is free, and open to any organization, company or school. In joining, your group will receive regular updates about the national green schools movement, as well as information about networking opportunities and ways to collaborate to advance the vision of green schools for everyone within this generation. For more information, and to fill out an application online, visit www.centerforgreenschools.org/coalition. The Center for Green Schools at USGBC works with an alliance of the nation’s leading educational and environmental associations, including the American Architectural Foundation, American Federation of Teachers, National Education Association, National PTA, National School Boards Association and many others to convene the Coalition for Green Schools. The coalition is in pursuit of a common mission: provide every child in America with a green school. A substitute to the House bill, advanced by Senate Appropriations Chairman Daniel K. Inouye (Hawaii) and Senate Majority Leader Harry Reid (Nevada), reduced or rejected many of these proposed cuts to important green building programs included in the House-passed bill, but unfortunately this new proposal was also rejected. The Senate bill would have reduced overall federal spending by $50 billion under the President’s request and $5 billion compared to H.R. 1. With the Senate continuing to lack consensus on a path forward and the House of Representatives prepping a short-term funding stop gap, it appears the battle over the budget is far from over. Stay tuned for future updates the ongoing budget discussions, and how they are impact green building programs. DOE and NREL: Zero Energy Building with Zero Added Costs? DOE and NREL: Zero Energy Building with Zero Added Costs? That's what I call Global Leadership. Now Let's Keep it Up. On Thursday and Friday of last week, member countries of the Asia Pacific Economic Cooperation (APEC) group got together to discuss the state of green building, building efficiency standards, and codes within APEC economies. The United States is the 2011 host of this prestigious, trade-based multilateral process, made up of 21 participating countries that comprise approximately 60% of world GDP and more than half of global trade. At the workshop - Green Buildings and Green Growth: The Enabling Role of Standards and Trade - it became abundantly clear that countries are moving at an astounding pace to implement sustainable building practices and other strategies to reduce energy use. While I was tickled to hear about Chile's new residential energy labeling initiative, and Indonesia's new 'Greenship' rating system, I couldn't help but think as the workshop went on: What is it going to take to maintain U.S. leadership on green buildings? As if to read my mind, USA at APEC did not disappoint. At the end of the two-day workshop, Roland Risser, Program Manager of Department of Energy's Building Technologies Program, wowed the crowd with a splendid testimonial of the National Renewable Energy Laboratory (NREL)'s Research Support Facility in Golden, Colo. – the largest zero energy commercial building in the country, which was designed and constructed to LEED Platinum standards with zero added costs. With the Better Buildings Initiative (BBI) in his back pocket, Risser had no problem showcasing to everyone in the room that the United States is, and has been, the trend-setter in green buildings. So what's a green building trendsetter like the United States to do? Well for goodness' sake, keep on, keepin' on! For the budget makers on the Hill: the United States has the lead – let's not lose it. Now, when we are on the cusp of a new energy revolution and zero energy buildings have just barely begun to break the cost curve, don't slash the White House request for energy efficiency and renewable energy. Instead, set the partisan rhetoric aside and start working with the White House on crafting new policies to help us stay competitive. You can focus on BBI and tax policy for starters. And for the Administration: Listen to Roland. His theme on Friday was, "Where there's a will, there's a way." Meaningful political commitment to sustainability has proven to be a catalyst for successful implementation and private sector action. Now how about a few more of those zero energy buildings? The LEED for Neighborhood Development rating system has been out in the marketplace and available to developers for several months now. With its release, interest continues to grow, both among local governments seeking a tool to achieve sustainability goals; and developers looking for a way to distinguish and strengthen their communities and cut carbon emissions. Unfortunately, LEED for Neighborhood Development is met with many challenges from existing zoning standards that reflect a bias against compact development, ranging from density maximums, to parking minimums, to bans on mixed use zoning. This all reflects the now outdated mindset of planners and policy makers from generations past, who were ruled by the automobile. The good news is that strides are being made to reduce the challenges that Neighborhood Development projects face, improving the ease in which walkable, sustainable communities can be incorporated in to our cities. USGBC is currently working with Pace University’s Land Use Law Center, with funding from the Oram Foundation: Fund for Environment & Urban Life, to develop a technical assistance manual and model overlay zone for local governments to work to remove these code barriers. These resources will be made available to local governments in the fall. Also, USGBC is now hosting an exhibit about LEED for Neighborhood Development, enabling our staff to work with local governments to raise awareness of the program and enact policy change. The Neighborhoods Go Green exhibit, which USGBC co-curated with the Chicago Architecture Foundation and Farr Associates, has been on display at the Chicago Architecture Foundation since. Nov. 14, and will soon be open at the AIA headquarters in Washington, D.C., from Mar. 14-Apr. 21. As part of the exhibit, USGBC assembled panels in Chicago and D.C. (forthcoming), consisting of local chapter members, and state and local government officials and staff to discuss how to encourage LEED for Neighborhood Development projects, and how to remove existing barriers to sustainable communities. In line with efforts to promote modern zoning codes and remove blocks to sustainable community projects, it’s worth noting that many LEED for Neighborhood Development projects have spurred important code-related changes or solutions within their communities. In Cleveland, Ohio, three high-profile LEED for Neighborhood Development pilot projects have given the city an opportunity to rethink how to create policies and tools to support green projects. With close involvement from the city, project team members and representatives from the Cleveland Foundation were able to create a set of green design guidelines that acted as an overlay for the three project sites. This meant that projects teams did not have to seek individual variances each time LEED for Neighborhood Development principles conflicted with current regulations. Similar success was seen in Nashville, Tenn., when the city adopted a new Downtown Code (DTC) in response to numerous projects seeking rezoning or variances. Above all, LEED is a powerful tool for communities looking to reduce their carbon emissions, and can help local governments rethink the regulations and design of their communities. Roughly 38% of carbon emissions in the U.S. can be attributed to buildings, with another 30% coming from the transportation sector. Redesigning our communities to better promote walkability and alternative forms of transportation, practices fostered by programs like LEED for Neighborhood Development, will go a long way toward reducing carbon emissions and accomplishing the goals set forth in the U.S. Conference of Mayors Climate Protection Agreement. Working to overcome code-based challenges is an important step in getting there. LEED for Neighborhood Development is a voluntary rating system that incorporates the principles of smart growth, New Urbanism and green building into a national standard. It was developed in partnership by the U.S. Green Building Council, Natural Resources Defense Council and Congress for the New Urbanism. For more information, consult the Local Government Guide to LEED for Neighborhood Development and stay tuned for additional resources this spring. What’s Holding Us Back From the Global Efficiency Opportunity? What if you were told that the United Nations, scientists, and economists had already identified the biggest opportunity for greenhouse gas emission reductions? That the key strategies for pursuing that opportunity were also the least costly to society? And finally—what if these greenhouse gas emission reduction strategies worked in tandem with successful economic development of emerging economies, and to the long-term resiliency of communities? Are you on the edge of your seat yet? Maybe you know where we’re going with this. The opportunity that the U.N., the Intergovernmental Panel on Climate Change (IPCC), the International Energy Agency (IEA), the World Economic Forum, and countless other climate and economic experts are talking about is none other than the world's building stock. Experts have identified the building sector as having the single greatest potential for greenhouse gas emission reductions worldwide, with efficiency holding the key to slash emissions from homes and office buildings by nearly 30% by 2020, at no net cost. They have also determined that this strategy can be highly profitable, with economic benefits for whole societies. Despite this golden nugget of knowledge we have about the impact of the building sector, the international community has a long way to go before we begin to capture the opportunity before us. That’s why USGBC, together with over 40 other environmental organizations, businesses, and green building councils around the world are calling for Global Leadership in Our Built Environment (GLOBE). The recently launched GLOBE Alliance is a group of like-minded organizations from 18 countries that will advocate for policies, technologies, and financial instruments for sustainable buildings and transportation infrastructure. An immediate attention to buildings and infrastructure is particularly important in the developing world, for both the planet and for the economies of growing nations. The IPCC estimates building-related greenhouse gas emissions will nearly double by the year 2030 under a high-growth development scenario, with this increase concentrated largely in poor regions of the world. But while the U.S. and other industrialized states must work with poor countries to develop strategies for sustainable new construction, we must at the same time lead the way in retrofitting our own energy-sucking, water-gobbling, money-burning existing building stock. The financial benefits of doing so aren’t chump change – the efficiency gurus at McKinsey & Company estimate that the U.S. could save $1.2 trillion in the next decade by investing in building efficiency measures. The question of how we pair economic growth with sustainability—both here at home and around the world—is intricately tied to the concept of the ‘green economy.’ This conversation is already underway at the U.N. Commission on Sustainable Development (UNCSD), which will be discussing buildings and sustainable production and consumption at its next meeting this May, and again in Rio de Janeiro in 2012 (known as the Earth Summit or Rio +20). In the meantime, Congress and the Obama Administration can do their part to make headway on energy efficiency policies here in Washington, and assist other countries in doing the same. A combination of U.S. leadership and international political will can go a long way in unlocking the energy savings, economic savings, and emission savings that buildings present. Green Building as a Mitigation and Adaptation Strategy: Who Made the Case At COP 16 in Cancun, Mexico?